Henbury is one of the most historic places in Bristol, probably originating in Saxon times. However, even before the Saxons, the Roman road to Gloucester passed through this area. Before new buildings at Henbury Secondary School were constructed, archaeologists found evidence of the people who lived by this road in Roman times. 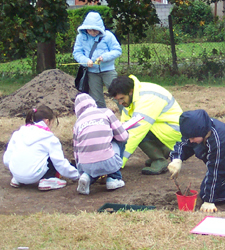 In 2006, Local Learning secured Heritage Lottery funding to recreate part of this archaeological excavation for Year 7 pupils from Henbury Secondary School. Over a two week period every Year 7 student had the opportunity to become archaeologists for the day; excavating, planning and interpreting the evidence of Roman life found beneath their school playing field.